Facebook let you block people from your account if you find someone annoying. In the same way, other people can also block your profile. This prevent further communication between two accounts and they won't be able to start a new conversation in any way. Neither they can see each other's profile, timeline posts, tags and other things. If you've been blocked by someone, you'll not get any message or notice from Facebook side. It's completely confidential until the person sends a let him know message manually to the blocked user. After checking your friend list, you may find that some of the people are no longer friend with you. So what happened to them? Saying that they have blocked you is completely wrong at this point. There are three possibilities. Either they have unfriended you, blocked you or deactivated their own account. If you've will to know that actually happened, this tutorial will guide you how to investigate the case. 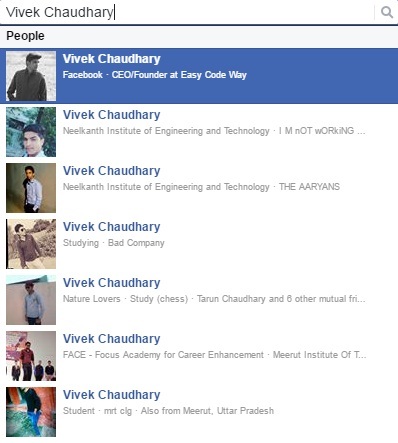 First thing you've to do is to search the name of person on Facebook. If you can find them and there is a "add friend" button on their profile, then he/she just unfriended you. At this point, we can confidently say that the person hasn't blocked you and it is active on Facebook (means he hasn't deactivate his account as well). On the other hand, if you don't find the profile in search results, it means that either he has blocked you or deactivated his account. Now lets take this search operation a step ahead. Just logout your account and search them again on Facebook. This time, you may find the profile. If yes, then the person is active and he has blocked you. In most cases, you won't be able to find the right person after logging out. This is because, their may be thousands of people with the same name and Facebook has no reference to show results which have mutual friends. If you don't find it, this doesn't means that the person isn't active. Last but not least, try to find their profile by searching them from your different account. If you don't have any, create a new one or use your friend account. Make sure that it has few mutual friends with the person. If you can find them, you can say that the person is active and most probably, he has blocked your account. After visiting the link, if you'll be redirected to the Facebook homepage or if it shows an error message, this means that the person has either blocked you or deactivated his account. To know the actual reality, visit that same link from different account, specially from one which has mutual friends. Also try to visit it while logged out. If you can find them, there is a high chance that they've blocked you. Once the person will block you, you won't be able to start a new conversation with them. This is what actually happens after blocking someone. But fortunately, you can still read those old messages. Open to your Facebook messages and find your conversation with them. If you're unable to send a new message and their name (which will be change to "Facebook User") is in black bold letter which is not clickable, there is a high chance that you've been blocked. Also check their profile picture. It will show a placeholder image instead of their real picture. To cross check this, try to send a new message from different Facebook account. If they respond, this means that their profile is active and you may be blocked. Try investigating further. Also read: What is Facebook Jail and what to do when account is blocked? This is a manual search where you can ask your mutual friends for the issue. Leave a message for them asking whether the blocker is active on their account or not and when did it come online last time. You can also ask your close friends directly face to face whether the person is using Facebook or not. Or it is just you who got blocked? This will surely give you right answer. Some people just clean their friend list to control an online addiction or simply to cut out all those friends who are no longer in touch. Also, think whether you've annoyed or bothered them. Read your old conversation and recall your phone & real talk to find what actually happened that forced them to block you? If you got the answer, surely you've been blocked by them. If it shows a real profile picture of user, then the profile is active and if it shows a placeholder image, then the profile has been deactivated. This method is for advanced users and it may or may not work. So don't stick to this method only. Additional Information: Earlier Facebook allow to use custom username in graph API instead of using long numerical user ID. Unfortunately, this feature has been removed for some security reasons and now it allow numerical user ID only which is very hard to get (especially if the person has blocked you). After blocking, you can still interact with the person in Facebook groups and apps. If you're a group admin and the blocker is the member of that same group, you can check his activities like posts and comments. If his name is in black bold letters and you're to unable to click it, this means that the person has blocked you. 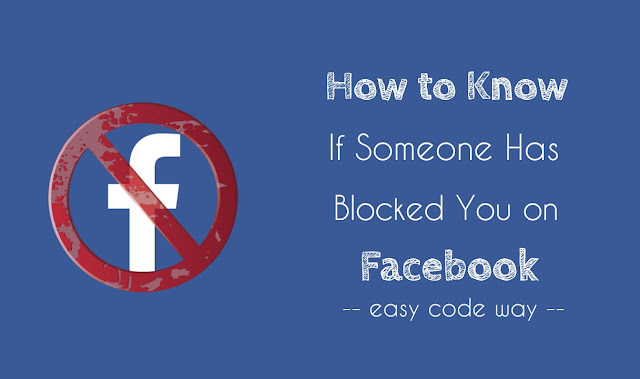 In this way, you can easily find out who has blocked you on Facebook. If you've any doubts, please let me know in below comment box. Do you know any other better way to investigate this case? Got this message when trying to check with Graph API.